Yesterday I posted a Welcome to our 2018 Choctoberfest event. It told you all about our event and gave you the opportunity to win some amazing #sponsor gifts. Missed it? No worries. Just head over to this post right now and you can learn all about it. I chose not to receive any sponsor products this time around but I am very familiar with all the sponsors and their generosity. I would like to thank Allison of The PinterTest Kitchen for all of her hard work with this event. As I was in my planning stages for this event my friend, Karen of Karen's Kitchen Stories, advised the members of our Festive Foodies group that today is World Bread Day. She requested that we bake and share a bread using yeast or sourdough to celebrate. Normally when I think of bread with chocolate I think of a quick bread like these Chocolate Oatmeal Muffins. However, I did make some Chocolate Cinnamon Rolls in the past so I knew that chocolate yeast bread was delicious. I found this recipe at Taste of Home, adapted it slightly and went to work. While it is not as quick as the muffins it was just as easy and the method was similar. 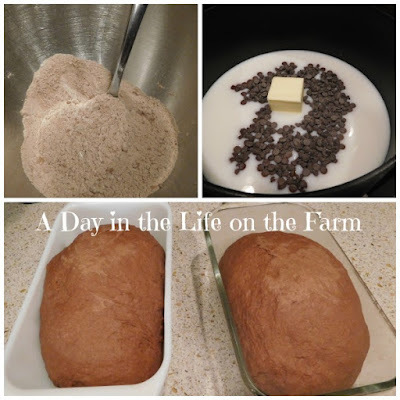 Combine the dry ingredients, including the yeast, and then mix in the wet ingredients. That's it. The kneading was done by my Kitchenaid Mixer and I could get on with my life during both of the rising periods. 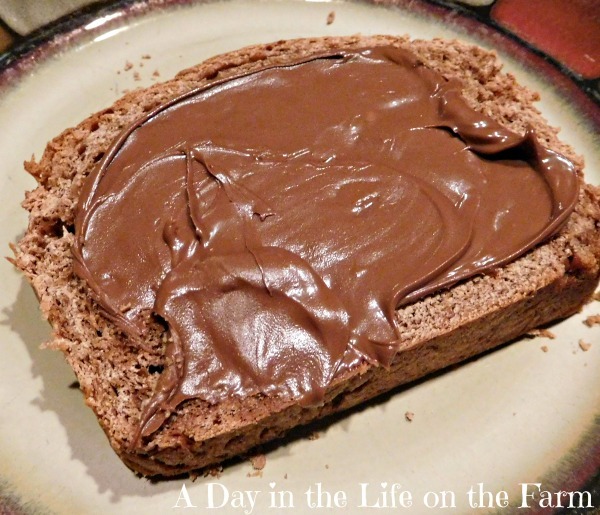 We have been enjoying it for breakfast each morning slathered with Nutella for even more chocolatey goodness. Except my husband who is not a Nutella fan, he just uses butter on his chocolate bread. Here are today's #Choctoberfest Offerings. Here is my recipe. You are going to LOVE it!! Place 1 1/4 cups of the flour, cocoa, sugar, yeast, salt and baking soda in the large bowl of a stand mixer fitted with the paddle attachment. Turn to low and stir just until combined. Place the water, milk, chocolate chips, and butter in a saucepan over med heat. Cook and stir until chocolate is melted. Remove from heat and let cool to 120*-130*. When liquid is correct temperature, add it to the dry ingredients and beat on medium speed for about 2 minutes. Add another 1/2 cup of the flour and the egg. Beat for another couple of minutes on med high speed, until fully incorporated. Reduce speed to low and add remaining flour, 1/4 c. at a time until a dough forms. Switch to the dough hook and knead on med speed for about 5 minutes, adding flour a Tablespoon at a time, if needed. Dough should knead into a smooth ball with no dough sticking to the sides of the bowl. Remove the dough ball, spray the bowl with oil and return the ball to the bowl, turning to grease entire ball. Cover and let rise in a warm spot for about an hour, until doubled in size. Remove the dough ball from the bowl and punch down. Divide dough in half and form 2 loaves. Place loaves into two greased loaf pans. Cover and let rise for another hour. Bake in a preheated 375* oven for about 30 minutes. Let cool on wire racks. Prep time does not include rising time of 2 hrs. What a great idea! I love the peanut butter idea (b/c who doesn't love chocolate and peanut butter?). But I am also wondering how this would be with cinnamon toast? I bet that would be wonderful Debra. I love this bread! 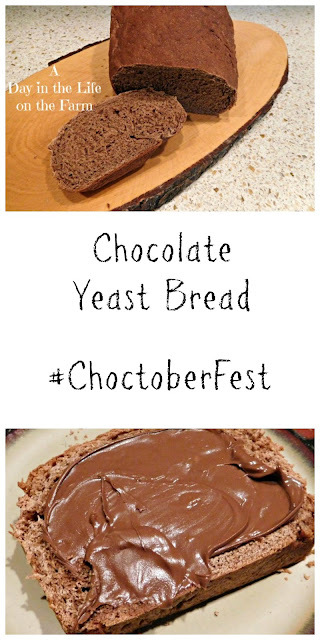 I really want to get more into baking yeast breads and like this idea of a chocolate one. This is an easy recipe too Amy. All it takes is time. 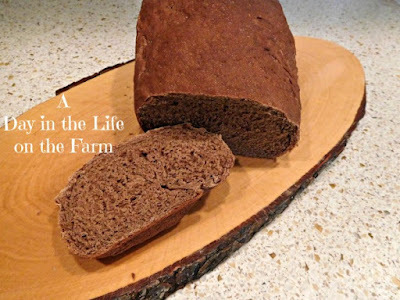 I bet this bread would be good in a trifle too! Thanks for joining me for World Bread Day! I made a bread pudding with the leftovers Karen. That slice with nutella looks extra heavenly! I need to get on this chocolate bread stuff ASAP!